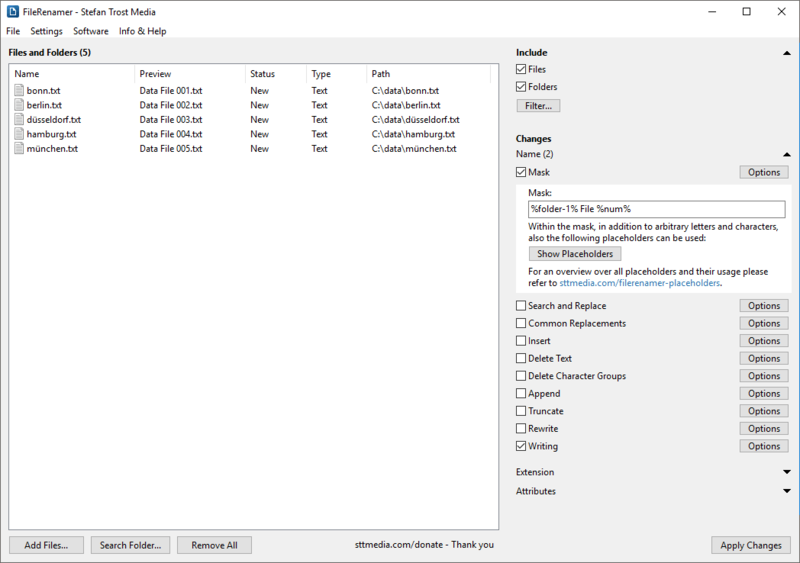 On this page you can see several screenshots of the FileRenamer. The screenshots are available for the operating systems Windows 10 and Windows 7. You can switch the shown operating system with the links under the screenshots. On the left side of the main window, you can manage the files and folders that you want to rename. On the right side, you can set which changes you want to apply. To add files and / or folders, you can simply drag the files and folders onto the program. Alternatively, you can also use the buttons below the file list. Whether folders or files are to be added can be determined in the top right under "Include". 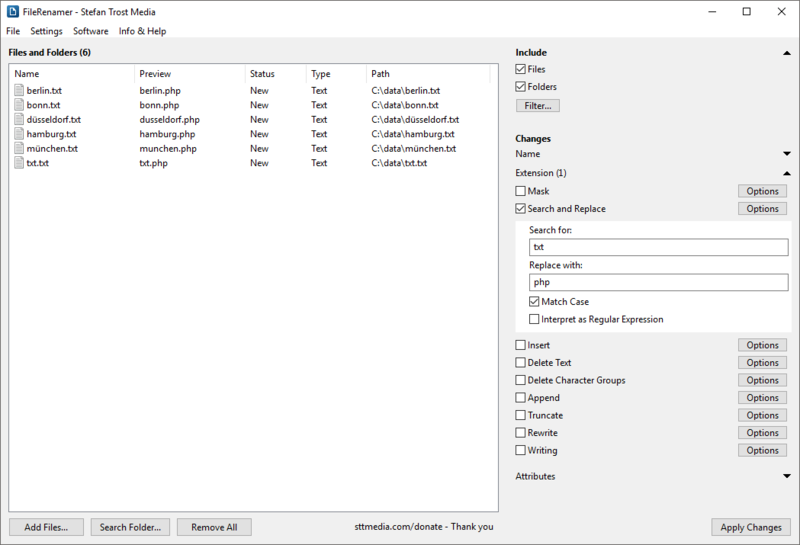 On the right side under "Changes" you determine how the name, the extension and / or the attributes of the files and folders should be changed. In the screenshot we only want to change the spelling. Of course, it is also possible to apply multiple changes in one run. To do this, we have checked the box "Writing" and selected the option "Capitalize Words". 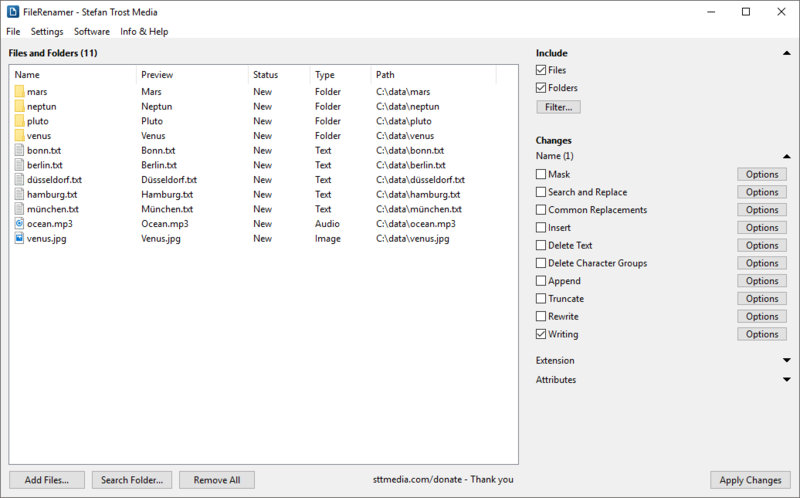 In the second column of the file list you can see a preview of the new file names. By clicking on "Apply Changes" you can rename all files and folders that are currently in the list. In the next screenshot, we show you how to number files with the File Renamer. For this we are using the option "Mask". In the field "Mask" you can use placeholders and any text, here we use the mask "%folder1% File %num%". The placeholder %num% stands for consecutive numbering. We also use the wildcard %folder1%, which represents the first folder of the file path. In between we write the free text " File ". In addition, since the change of the spelling from the last screenshot is active, the new file names are "Data File 001" to "Data File 005". An overview of all available placeholders we have put together for you in the placeholder overview. In the menu "Settings > Numbering" you will find all settings for the numbering. For example, here we have activated leading zeros. In the section "Extension" you will find options to change the file extension. Here we would like to change the extension of the files from txt to php. For this we use the option "Search and Replace", where you can also use regular expressions. As you can see, changing the file extension works regardless of the name of the file: The file txt.txt is renamed to txt.php, the "txt" from the name is not replaced. In addition, we have activated the option "Rewrite > Remove Diacritics" for the name part. Therefore, the "ü" in Düsseldorf and München changes to "u". If you want to turn the "ü" into an "ue", you can choose the option "Replace Diacritics" instead. 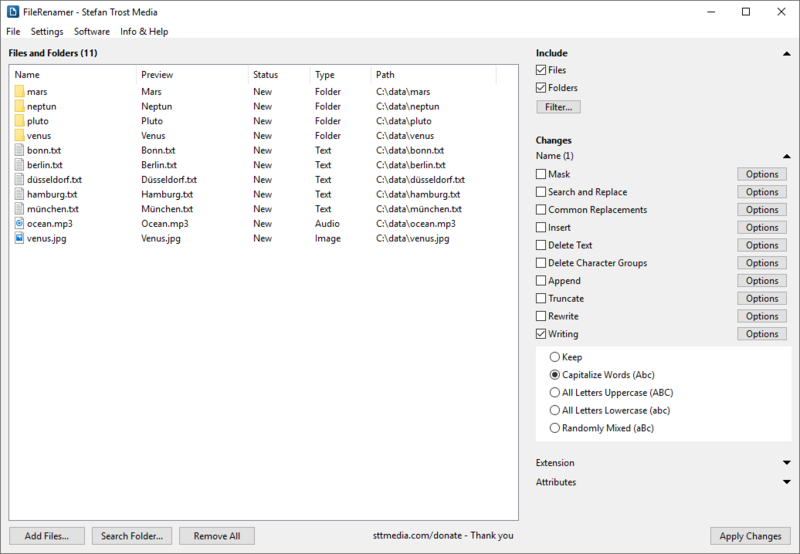 Also the attributes of files and folders can be changed with the File Renamer. These include the attributes hidden and read-only as well as the creation date, the modified date, and the last accessed date. 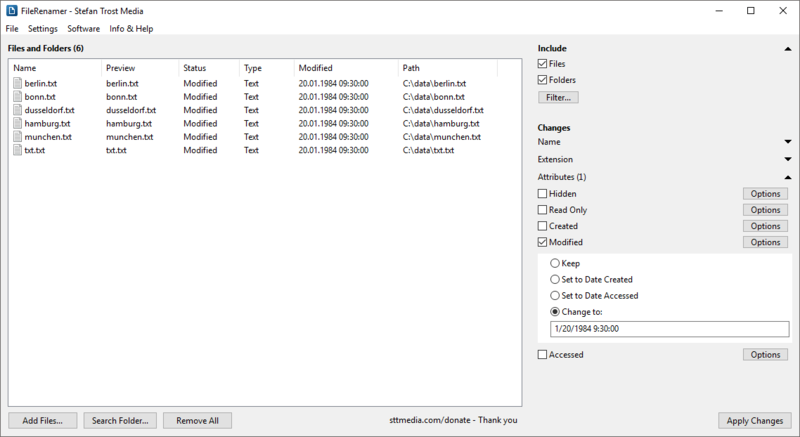 In the screenshot we change the "modified" date of the files in the list. We set the date to a fixed value. It is also possible, for example, to set the date to the creation date or the date of the last access of the modified file. Further screenshots of the FileRenamer can be found on the page First Steps.